07 | October | 2010 | What's Cooking at the Genua's? I’ve been trying to come up with a recipe today and my mind just keeps getting sidetracked. It’s Thursday, I have an hour left before I go to “Happy Hour” with the neighborhood ladies and I am still sitting here wondering what to use in today’s blog. First I thought about doing a “happy hour” recipe, then changed my mind. I am clueless today. Good thing I don’t have to drive anywhere! We have it at our homes, we take turns once a month. So I just have to walk a few houses away. But I still want to make sure this is done BEFORE I go meet the ladies. So I was just looking everywhere for anything. It’s been one of those days today. Not much sun out and under 80 degrees for a change. It is fall after all! Then I came across an email I got from Fine Cooking. The recipe looked pretty simple and it’s pretty quick to make too. That is always a plus. 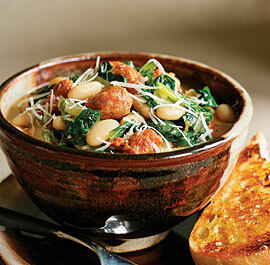 If I had escarole in the house I’d make this tonight. But I don’t so I will make it next week. Hopefully I will get another cool “fall” day in Florida! The recipe calls for regular hot Italian sausage. I have not used regular sausage in my cooking at home in a very long time. I have used pre-cooked or uncooked chicken sausages. They come in all kinds of flavors these days and are really tasty. They have Italian style also and spicy versions as well. So that’s what I will use. Whenever they are on sale or I have coupons I stock up. They freeze extremely well. Always good for a quick snack too if you get company. Just nuke em and slice em up. Stick a few toothpicks in and serve with mustard or whatever you have for dipping. Voila! If you don’t like spicy, use regular. No worries! I will also up the amount of garlic, hey, I’m Italian, I need my garlic! For now the photo is the one I got with the recipe, but as soon as I make this myself I will swap it for my own. Seems like I take pictures of every meal these days, just in case! If anybody makes it let me know! 1. Heat the oil in a heavy 5-6 quart Dutch oven or large pot over medium heat. Add the onion and cook, stirring occasionally, until tender, 5-6 minutes. 2. Add the sausage, raise the heat to medium high and cook, stirring and breaking up the sausage with a wooden spoon or spatula until lightly browned and broken into small (1″) pieces, 5-6 minutes. 3. Add the garlic and cook for 1 minute, stir in the beans. Add the escarole to the pot in batches; using tongs, toss with the sausage mixture to wilt the escarole and make room for more. 4. When all the escarole is in, add the chicken broth, cover the pot and cook until the beans are heated through and the escarole is tender, about 8 minutes. Season to taste with the vinegar and salt. Transfer to bowls and sprinkle each portion with the parmesan cheese.